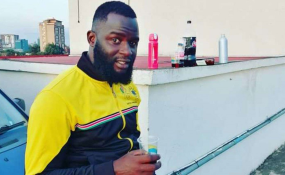 James Radido Oduor aka ‘Odu Cobra’ who was killed in the 14 Riverside Drive terror attack. My good friend and colleague Japheth Mutinda, who edits this column, is one of the biggest football fans I know. Like me, he's a diehard Madridista. He also has a longstanding intimate affair with Arsenal and the Brazilian national football team. And he loves his Tusker; the Ruaraka-based club, not the alcoholic beverage by the same name. Yet, Japh is not a 'sofaset branch' football fan. Every weekend, when he's done with his graveyard shift on the Nation Sport desk, the guy loves going out to the stadium to catch some action in the Kenyan Premier League, especially when his beloved Tusker is playing. Last weekend was no different. He has recounted to me how last Sunday he made another pilgrimage to Kasarani Stadium to watch Gor Mahia's clash with Cameroonian side New Stars de Douala in a Caf Confederation Cup first leg play-off match. He tells me that like on so many other occasions he was in the company of a close buddy of his by the name James Radido Oduor, or simply 'Odu Cobra' among his contemporaries. Throughout the match, Japh recalls, Cobra kept ranting and raving about the 'questionable' technical decisions of Gor Mahia's Turkish-Cypriot coach Hassan Oktay. When the coach pulled out creative midfielder Francis Kahata for George "Blackberry" Odhiambo, Cobra was so incensed to the point he threatened to storm out of the stands in protest. "I'm here to watch beautiful football! Kahata is the only player on the pitch who plays that kind of football," he fumed. Thankfully, other close friends including Raymond Omondi and sports journalist Jeff Kinyanjui, prevailed upon Cobra to stay on until the end of the match. Still, Cobra wasn't happy with the proceedings on the pitch. He wanted the 'ineffective' Rwandan striker Jacques Tuyisenge substituted. Then right at the death, Tuyisenge struck for what would be Gor Mahia's match winner and Cobra wildly celebrated the goal like a man possessed, never mind his initially misgivings about the goal scorer. "I'm not celebrating the goal, I'm only celebrating the sumptuous cross which led to the goal," he was quick to say in cheerful jest. That was Cobra for you - a stickler for perfection. The man loved beautiful passes, crosses and even well-executed goal-kicks! Those moments will forever remain etched in Japh's mind. Turns out there were the last moments he would share with Cobra, who was among the victims who lost their lives on Tuesday during the 14 Riverside Drive terror attack, where atleast 21 people lost their lives. I had learnt of Cobra's death earlier on Wednesday morning, long before Japh shared his poignant tale. My editor, Kenfrey Kiberenge, had posted a curt and sombre message in one of the WhatsApp groups I belong to. "Guys it is a sad day for me and my friends I have lost my good friend James Oduor. He was at the hotel when the attack happened," read the message which triggered a flurry of the standard 'pole sana' messages which Kenyans accustomed to offering those who are grieving. Unbeknown to most of my colleagues on the desk, their 'pole sana' messages were actually misdirected. My editor had only forwarded the message 'as received'. About an hour later, my bosom friend and multi-media journalist, Isaac Swila, frantically attempted to reach me on phone. But I only got to see his missed calls much later. When I returned the call, Swila told me that he'd been made to believe I was related to Cobra - which isn't the case, I actually never knew him in person - and that he wanted to reach the family through me. Such was the great interest that Cobra's untimely demise evoked within the Kenyan sports journalism. I've since read endless eulogies from my colleagues and friends in the media about this young man whose life was brutally cut short at his prime by cold-blooded Jihadists who place little value on human life. All the messages paint the picture of a fun loving young man with a trademark heavy beard who possessed the charm and wit to warm his way into the hearts of his close friends. The demise of Cobra, like that of the more than a dozen victims of the Riverside Drive terror attack, is indeed a heartrending one. Although gone, their spirits will forever live in the hearts of family, relatives and friends with whom they shared their lives. Go well Cobra and all victims of Riverside terror attack. Till we meet again.